Vision for the Church- PROPHETIC REVELATION; PROPHET-OFFICE - God's Outreach Ministry Int. During the worship of a meeting at a local Church in Lakeland, I saw in the spirit-ground a different picture, than you can see usually the sanctuary. Just on the front platform I saw the Ark of the Covenant placed in the middle. There was a High-priest with a of smoke-incense toward the Golden altar of incense and several other priests in ancient priest clothing’s. They were worshipping and bowing down before the Ark of the Covenant! Then I saw a crowd of people in white (priest) clothing worshipping around this ark (before the Throne of God) and still inside the church building. It seems to be that everything was lifted up into Heavenly atmospheres! It was a super-natural event, which I cannot comprehend with my natural and fleshly nature! In some way I saw that all this worshippers were touching the Merci-seat of the ark with both hands. Listen to Golden Altar Worship by Freddy Hayler when you read this page! These people in these white robes are My people who are wearing the robes of humility! They had to pay the price and had to buy from Me treasures, which was tried into the fire, and now they became rich during this devoted passionate worship! They have the purity of soul and heart, the obedience to the truth, the discernment of the voice of the Holy Spirit! They have found Me and received My power to worship Me, to speak, to preach, to prophecy, to heal, to reveal the truth, to oppose, to discern, and to cast down demons from their thrones. They are My elected People, with the label of quality, who God had prepared to operate for this *End-time! They are not standing there coincidental! They are standing there because I brought these precious righteous saints there. 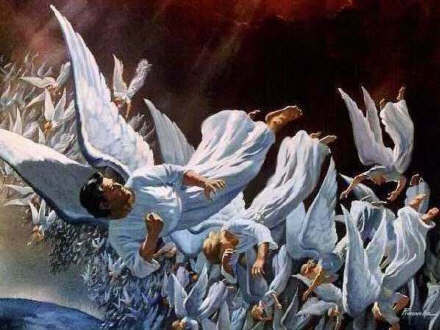 I had prepared their hearts” for this End-Time! 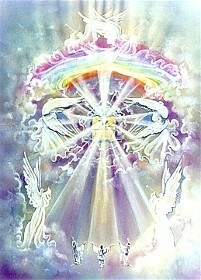 See more about this subject on: www.Endtimeharvestrevival.org and the Book of Revelation illustrated! In ancient times only the High Priest could go in ones a year into the Holy of Holies and minister to God! (Day of Atonement; Yon Kippur) When you touch the merci-seat you are privileged, because you can always come back. There is no limit in time! But understand you have to come in adoration and passion for God only! Some will still come with the wrong clothing’s & attitude and they are profaning His Holy place! By discernment God will oppose them! This Holy place will be operational and very real on the moment you start passionate radical worship for G-D! #Picture-source with permission: www.Revelationillustrated.com © Please respect the copy-rights! “You can enter it right now and dwell in the Glory of the Lord Most High! It is the will of God to show you how to dwell there! It is the realm in the Heavenly places, which will break the heavy yoke! It is the place where inspired by My Holy Spirit; Heavenly Angelic symphonies play free-flowing music melodies in scales of indescribable beauties; are like a Spontaneous Well of Living Waters gushing forth from My Holy Throne that will flow for your refreshment. It is the place that you should listen in silence to the gentle voice of My Holy Spirit that will tell you what is yet to come! That will happen on the moment you will touch the merci-seat! Are you ready for this? This will remain of the sincerity of your consecration and the depths of the Revival can sweep in this place! ? Then a cloud covered the tent of the congregation, and the glory of the Lord filled the tabernacle. (Exodus 40:34) The cloud (the symbol of the visible presence of God) and the glory of God filled the tabernacle when all things were completed, anointed, sanctified, and made Holy for Divine services and the Divine Presence. Moses could not enter the tabernacle for such overwhelming Shekinah glory (Exodus 40:35). A similar glory appeared when Solomon finished the temple (1 Kings 8:10-11). And it came to pass, when the priests were come out of the holy place, that the cloud filled the house of the Lord, (1 Kings 8:10) It is the appearance of God's Shekinah glory is as a visual sign of God’s presence that He wants to show His people his appreciation for the worship! Worshipping the lord is not limited in time. There are fazes and levels to go through! Own deigned short outlined pre-programs are not always God’s perfect will! Make time to worship the Lord! Maybe even in spite of the preaching! Place of worship is symbolic the Sanctuary of God. Everyone should have access on it to dance, to bow down, to lay down, to kneel down or just to stand. Place need to be provided! It is an actually place in the Holy of Holies—Chambers of God—in the Spiritual Realm! Consider to have one larger meeting instead of two! I believe God will give you therefore the Key of finding a larger place, by just to have obedience to Him! Worship in the Spirit and Truth is a major KEY for Revival! It’s a (new) beginning of obedience to God. The first step for a converted sinner or backslider convicted by the Holy Spirit is a deep repentance. Deep repentance requires a broken and contrite heart and then a forsaking of the old worldly (dead) man before the Throne of God. The curse on the sinner’s life is broken, and the sinner is transformed into a new creation, according to the image of Yeshua, the Messiah or Jesus the Christ! A great multitude of people; lost souls, backsliders, hungry people, are desperate waiting for your correct response! You as devoted Christian have also your destination to reach out to the lost souls and to the rebellious children! And whether they will hear or they will forbear; this generation, (“Christian” or non-Christian) shall know that there have been sons of God (All kind of ministers; apostles, prophets, teachers, evangelists and shepherds...etc.) among them! These ministers will raise from where mankind did not really expect! They will be revealed, which was secret for man! Apply it for your Church or Ministry! By releasing this vision for a specific certain Church in Lakeland, these Pastors had ignored the message from the Prophet. Never was there a response or a sign of joy concerning this vision. If they were not open for this vision and not willing to receive it, than God Himself can remove this promise and blessing and give it to other Churches and ministries as well. If people chose to look at men instead the servant who is send by God, than there is an issue by these receivers, not by God's servants the prophets. Today I know from several Pastors, they have received this vision as it is from the very God Himself! There is a related site " Brokenness"! It was created out of what is revealed and written on this site! This "Neutral" page of "Vision for a local Church in Lakeland; FL"